An alternative power supply scheme is being designed. The teams of electricians which were to see to one of the damaged power lines near Avdiyivka could not do their work because of fire attacks by pro-Russian militants, the Ministry for Temporarily Occupied Territories has said on Facebook. "Repair works were not started due to the violation of a cease-fire. Repair teams attempted to restore power supply via a band-aid circuit however this was not for long," it said. The ministry is working with technical experts to design an alternative power supply scheme. 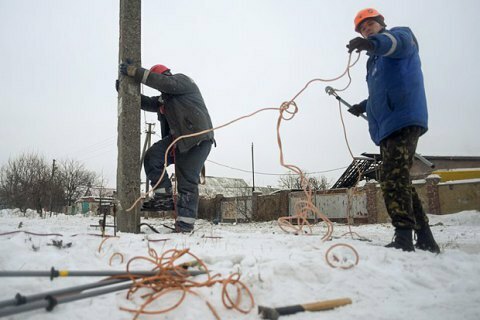 The only remaining power line feeding the town of Avdiyivka was damaged on the evening of 30 January. As a result, it was left without water and power supply while central heating is limited and ensured with the help of the local coking plant. Technicians could not start the repairs due to constant shelling by pro-Russian militants.